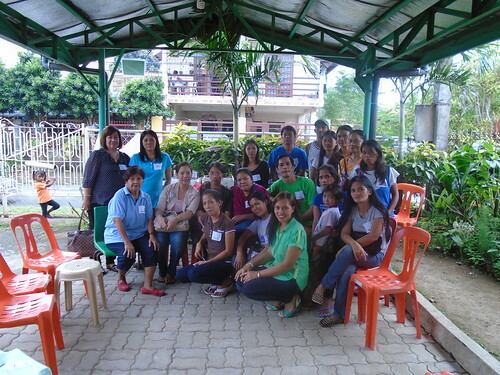 It was a fine Saturday afternoon last November 29 when I attended a ASP parent support group meeting. The meeting was attended by 18 parents (2 fathers and 16 mothers) leaded by our ever supportive ASP president, Ms. Cathy. The meeting was started and ended with a prayer. It was a great experience for me to hear same sentiments that I personally have. All of us opened our hearts and minds in sharing our experiences, hardship and accomplishment with our angels. I was amaze to hear stories of all the parents on how they overcome all struggles and difficulties in bringing up their child; how ASP has been a great help for them in taking care of their child's special needs and teaching them on how and what to do in those special cases. I thought it was an ordinary meeting but it turned out to be a very important eye opener for all parents, most specially me, who feels helpless having a special child and don't know whom to talk to and asked help in times of our difficulties. ASP has been instrumental to all of us parents in making our life more easier and happier. I am thankful to my father who introduced me to Ms. Cathy and push me to enroll Buboy to the center. We might started out late for him, but we started it right! Every single accomplishment is a milestones for him, and I wanted to witness every step of it. I together with our family will be there to support and love him all the way. accomplished as mom to Buboy. I really pray that ASP will be there to help us and teach us more things and make taking care of our angels heaven sent!